Since 1928, Delgado Guitars has been a family business. Started by Manuel’s grandfather and great-uncle, then passed down to Manuel’s father. Manuel A. Delgado is the youngest child of Candelario "Candelas" Delgado, but the first to begin in the family guitar business. He was playing guitar by age five, repairing guitars by age seven, and built his first guitar at the age of 12 to beat his father's record of 14. In 2005, Manuel and Julie Delgado moved to Nashville, TN. He quickly built a great reputation in Nashville in a short period of time and somewhat "starting over" in Nashville is something in which he's proud. "I was humbled by God and knew that anything worth having in life would be a fight, plus I could relate better to the musicians who are doing the very same thing for their passions and dreams." 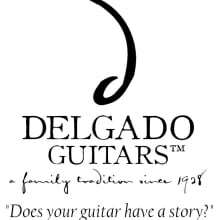 Today, Delgado Guitars is run and operated by Manuel Delgado and with the addition of his daughters, Ava Canción and Lila Armonía, Manuel and his wife Julie pray to be around for a long time. Already being highlighted in "The Fretboard Journal", "Tennessee Crossroads", "NPR", and featured in a "BOSE" commercial, Manuel Delgado has proven he makes a product that is sincere and of quality. Before you make a decision to purchase a guitar somewhere else, give Manuel a call and you'll see why they have built such a strong reputation on their achievements alone. Does your guitar have a story?